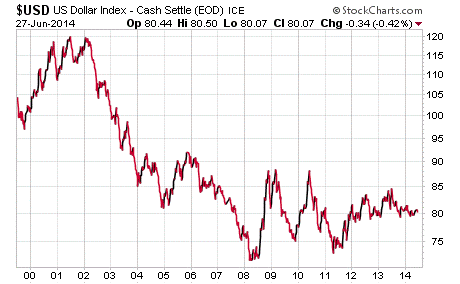 How Will the U.S. Dollar's Decline Affect You? Dollar Looking Sick -- How Will It Impact You? The U.S. currency's privileged status on the world stage as “King Dollar” is slowly coming undone. As more nations move to bypass the dollar in international trade and exchange their holdings of shaky U.S. Treasury debt for the solidity of gold, the value of the dollar may take an epic tumble. Last month, Russia signed a historic 30-year contract for natural gas delivery to China that will eschew use of the U.S. dollar. Instead, the two powers will do business in their own respective currencies. It's a direct frontal assault on the “petro-dollar” system. We don't think the Chinese or Russian currencies will replace the U.S. dollar as world reserve currency – not anytime soon. At present, there is no single currency that is positioned to replace the Greenback in global trade and world central bank reserves. Most of the buck's leading competitors, including the euro, are themselves being depreciated to prevent them from gaining value. In fact, the European Central bank recently took the unprecedented step of imposing negative rates of interest on commercial bank deposits! It's a desperate attempt to ward off an economic contraction, and it proves that no major fiat currency today is sound. 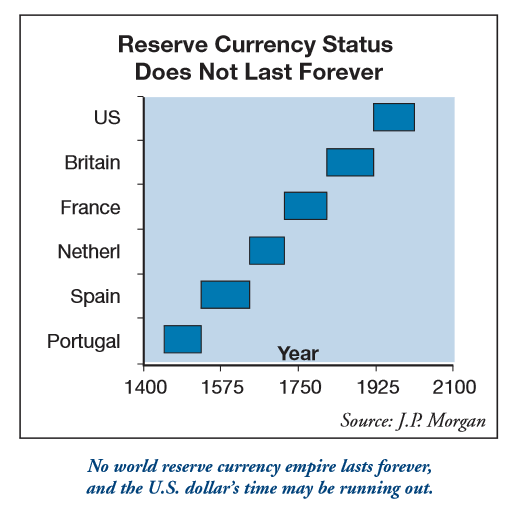 As all fiat currencies race to see who can depreciate the fastest, gold figures to gain prominence as a time-tested sound currency. Chinese imports of gold set records last year (and what's on record is likely an underestimate of the real total). China's ally Russia is now the world's seventh biggest gold holder and seems intent on accumulating even more of the monetary metal. In April, the Central Bank of the Russian Federation purchased 900,000 troy ounces of gold – its second largest monthly purchase ever. Physical silver is impractical for most central banks to hold in significant quantities as reserves. Logistically, silver just can't be obtained and warehoused in multi-billion-dollar increments the way gold can. But for non-billionaire individual investors, silver may be the most practical metal to hold in personal reserves. Silver is the hard money you'd actually be able to use for everyday transactions, just like Americans did before the silver was removed from our dimes, quarters, and half dollars in 1965. Of course, gold has some practical advantages, too – it's easier to transport and conceal and tends to be less volatile. According to the U.S. Constitution, both gold and silver are the legitimate currencies of the land. Individual states may recognize gold and silver coins as payment for all debts. In June, Oklahoma joined Louisiana, Texas, and Utah in exercising their Constitutional right to grant U.S.-minted gold and silver coins legal tender status. To be clear, bartering with gold or silver coins is legal in all states. However, states with legal tender recognition make it much easier for citizens to receive payments or pay bills in gold or silver. Legal tender status means no state income taxes apply to transactions involving gold and silver American Eagles (and certain other U.S. coins). What's needed to allow gold and silver to compete on a level playing field with the U.S. fiat dollar is what Oklahoma has done – except at the federal level. Until then, we as individuals can go on our own bi-metallic standard, bolster our own reserves of gold and silver, and even take advantage of opportunities to use precious metals as money in legal barter transactions. Every American should have a basic foundation in pre-1965 90% silver coins – handy for bartering in small increments and widely recognized. Beyond that, pure silver rounds in tenth-ounce, half-ounce, and full-ounce sizes (all available from Money Metals) will also come in handy. You can then round out your barter stash with some Silver and Gold Eagles, which may be preferred by some parties over other types of bullion – especially in states that specifically recognize U.S. gold and silver coins as legal tender.